Gary Tyra, Downers Grove, IL: InterVarsity Press, 2015. Reviewed by Jeffrey G. Betcher, MD, FRCPC, MA(Bioethics), who is clinical assistant profesor at the Colleg of Medicine, University of Saskatchewan and is Department Head and Medical Director of Critical Care at the Regina Qu’Appelle Health Region in Regina, Saskatchewan, Canada. Peter Nynas, Mika Lassander, and Terhi Utriainen, Editors, New Brunswick: Transaction Publisher, 2015. ISBN 978-1-4128-5482-5. 282 PAGES, PAPER. $44.95. 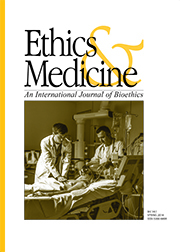 Reviewed by Susan M. Haack, MD, MA(Bioethics), MDiv, FACOG, retired from consultative gynecology at Hess memorial Hospital and Mile Bluff Medical Center in Mauston, Wisconsin, USA. Todd A. Salzman and Michael G. Lawler, Washington, D.C.: Georgetown University Press, 2002. ISBN 978-1-58901-913-3. 192 PAGES, PAPER. $27.95. Reviewed by Agneta Sutton, PhD, Lecturer at Heythrop College in the University of London, UK. Matthew Nelson Hill, Downers Grove, IL: InterVarsity Press Academic, 2016. ISBN 978-0830839070. 247 PAGES, PAPER. $30.00. Reviewed by Stephen N. Williams, MA, PhD, who is Honorary Professor of Theology, Queen’s University, Belfast, Northern Ireland and serves on the Editorial Board of Ethics & Medicine. Roberto Cipriano (translated by Laura Ferrorotti), New Brunswick, NJ and London Transaction Publishers, 2015. Reviewed by Donna Yarri, PhD (Religious Studies), who is Professor of Theology at Alvernia University in Reading, Pennsylvania, USA.